Andhadhun is an upcoming Indian thriller film directer is Sriram Raghavan. The film stars Ayushmann Khurrana, Tabu & Radhika Apte in the lead roles. 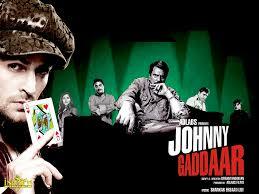 Johnny Gaddaar is a 2007 Bollywood neo-noir thriller Movie writter/directer Sriram Raghavan, producer under the banner Adlabs. It starring Neil Nitin Mukesh,Dharmendra, Zakir Hussain, Rimi Sen, Vinay Pathak, Govind Namdeo,Dayanand Shetty and Ashwini Kalsekar. Agent Vinod is a 2012 Indian action spy film directer Sriram Raghavan, and writter Sriram Raghavan and Arijit Biswas. The movie borrows its name from the 1977 film of the same name. The film starring Saif Ali Khan and Kareena Kapoor.